Production at Pisco LOGIA is about honoring tradition with care, attention to detail, and love of the process. Every aspect of production is by artisanal methods. 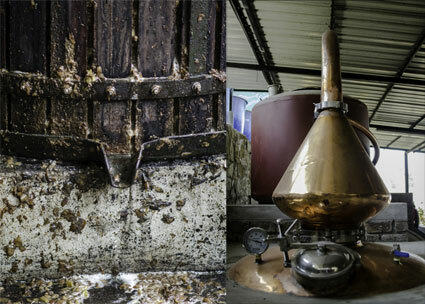 The brandies are distilled from estate grapes, crushed by foot followed by a light mechanical extraction. Fermentation is at ambient temperature using native yeasts. 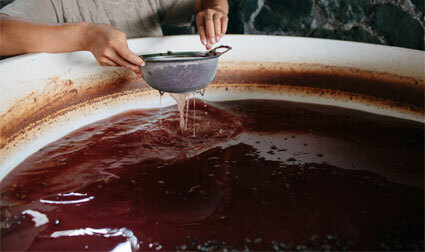 By regulation, pisco distilled in Peru must conform to traditional modes of production: restricted grape varietals, single distillation on a copper potstill (the Pisco LOGIA still is 300 liters), distillation to proof, no dilution with water, no additives, no barrel aging, minimum of 3 months resting in a neutral container. Pisco LOGIA adds an additional 3 months to the resting period to more fully mature and integrate the brandies.